Darrell Montague is our #1 Flyweight Prospect and arguably a current Top 10 fighter in the Flyweight Division. Montague made his MMA debut in 2008, winning his first fight in highlight reel fashion via spinning backfist (see Video 2 below). He followed that up with back-to-back submission wins before losing his first career fight to future UFC Featherweight Robbie Peralta. Montague soon dropped down to the Flyweight division, where he has since gone 10-1, with his only loss coming to UFC Flyweight contender Ian McCall. Montague started to make a name for himself in the Tachi Palace Fights promotion, which was home to many of the top flyweights in the world before the UFC debuted their division in 2012. After going 2-0 in the promotion, Montague faced off with UFC veteran Ulysses Gomez for TPF’s Flyweight Championship. In a surprising upset, Montague was able to stuff Gomez’s takedown attempts and strike his way to capturing gold. Unfortunately, some of Montague’s thunder was stolen that night as Ian McCall defeated former consensus #1 Flyweight Jussier Formiga earlier on the card. Montague would put his title on the line against McCall in his next fight. McCall was ultimately able to out-wrestle and submit Montague after a competitive first few minutes. Shortly thereafter, the UFC announced their plans for a Flyweight Division, which led to the signings of some of the top Flyweight free agents in the world, but for whatever reason, Montague was left out in the cold. Montague has gone 4-0 since the loss to McCall, including a win over former Shooto kingpin Mamoru Yamaguchi, but he has still yet to receive the call from the UFC. With TPF shutting their doors, Montague has few options in facing high-level competition. Millennia MMA is one of the top camps on the West Coast for lighter weight fighters. From WEC veterans Charlie Valencia and Manny Tapia to Bellator veterans Georgi Karakhanyan and Saad Awad, the camp is stocked with talent. Millennia MMA finally made its presence felt in the UFC with Lorenz Larkin’s arrival. Hopefully, Montague’s signing is not too far behind. Montague has also trained BJJ under UFC/WEC veteran Javier Vazquez. 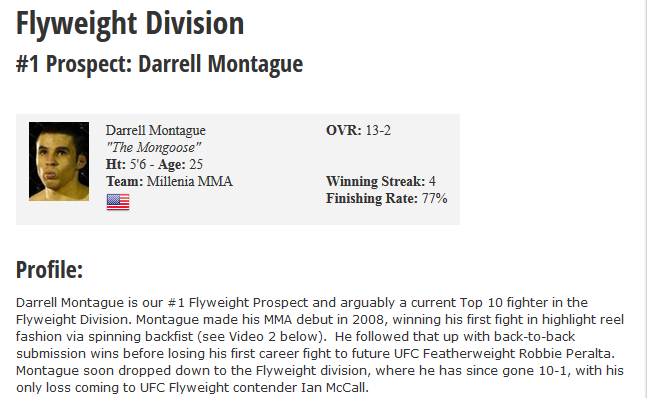 When the UFC introduced its Flyweight division, they forgot to sign one of the Top 10 Flyweights in the world, Darrell Montague. 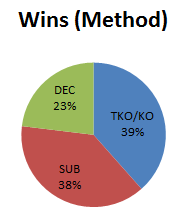 There is absolutely no reason Montague should not be competing in the UFC right now. It was rumored that Montague’s loss to McCall may have given UFC matchmaker Sean Shelby doubts about signing him. Montague has proven throughout his career that he is one of the most exciting fighters in the division, complete with knockout power and solid submission skills. If Montague were to sign with the UFC, he would likely be a title contender in the very near future considering the lack of depth in the division. Though Montague’s wrestling would likely hold him back from winning a title at this point, there is no more deserving fighter on the regional circuit that deserves an opportunity in the UFC than Darrell Montague.